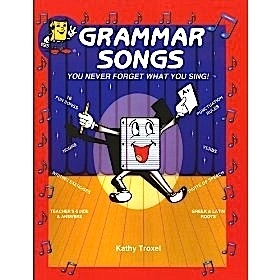 This is 1 of 16 Grammar Songs by Kathy Troxel. Quotation Mark Song MP3 from Grammar Songs by Kathy Troxel Quotation marks go before the sentence said and after the sentence to show what someone said. Quotation marks go after the period or after the comma, the question or the exclamation. When a quoted sentence is interrupted by an interruption like "he said" or "she said," quotation marks enclose the part of what is said. Inside the quotations use commas when it's interrupted. Quotation marks go before the sentence said and after the sentence to show what someone said. Quotation marks go after the period or after the comma, the question or the exclamation. When you have a conversation between two or more people, each time the speaker changes, you indent what they said. Quotation marks go before the sentence said and after the sentence to show what someone said. Quotation marks go after the period or after the comma, the question or the exclamation. Sometimes a quotation's inside another quote. If this should ever happen, you use a single quote ( ' ). Use a single quote inside a double quote ( " ). That way we can tell if he said, "She said, 'It's over.' " Quotation marks go before the sentence said and after the sentence to show what someone said. Quotation marks go after the period or after the comma, the question or the exclamation. copyright 1984 by Kathy Troxel/Audio Memory sung by Tony Bowman, guitar - Joe Cadrecha Grammar Songs book and Teacher's Guide sold separately.